It is up to you just how proactive you will be working with the REBSEA program. Whether you have just joined or have been with us from the beginning there are now many ways to take full advantage of your membership to both increase your business and your support for the causes that you care about. It is a PROCESS, and like anything else, you will get out of it what you put into it. If you find that you are simply too busy with a demanding business and life to devote much time and effort to working with our program, please read Part 2 and see what benefits you can expect from your membership as REBSEA continues to grow and expand its outreach into the nonprofit sector and with the public. For members who intend to be proactive and get the maximum benefit from their REBSEA membership you will find that Part 1 is an outline of the many things you can do to attract new business while actively participating in helping to grow the REBSEA network to its full potential as a force for positive change. If you are a NPO member please read Part 3 to see the many ways that you can receive the most benefit for your NPO from your REBSEA membership. MEMBER RESOURCES This 'members only' section of the website contains some helpful tools. Here you can find the REBSEA logo and banner to add to your website and marketing materials; a template for issuing a press release about your joining REBSEA along with instructions on how to do this; how to connect with REBSEA on LinkedIn and Facebook; an example of how to present REBSEA on your LinkedIn page; a template for a letter for NPOs to send to their supporters informing them about our program and introducing our local REBSEA member(s); a template for a letter you can send out to NPOs introducing yourself as a REBSEA member and inviting them to become a NPO member (at no cost); examples of marketing materials created by a few members. This section will be updated as new 'tools' are created. BLOGGING REBSEA regularly blogs to our database and our social media network, which are extensive. The subjects appeal to a wide variety of causes and features REBSEA members who are associated with and /or supporting these causes. This drives traffic to our website and Member Directory where the public will see your profile and a link to your website. We urge all members to send these blogs to THEIR social media network. If you do not have a database that you send marketing materials to you may want to start one and grow into a significant part of your marketing. EMAILS TO NONPROFITS THAT YOU HAVE DONATED TO OR WANT TO SUPPORT. The template for this type of email is in the Member Resources section of the website or you can create your own. Feel free to use anything on the REBSEA website to include in such a letter or for any purpose. Please invite these NPOs to become NPO members of REBSEA. They will have a profile and a 'pin' in the Member Directory. This can gain them access to our growing network of those who donate regularly to NPOs. They can join our Leadership Committee and work with our members who are focused on their cause. By joining they are agreeing to inform their supporters about REBSEA and introduce local REBSEA members. Encourage them to add REBSEA information to their website, LinkedIn and Facebook pages, newsletters, etc. Ask if you can attend their fundraising events to meet their supporters and tell them about your support for their mission. Inform those NPOs that you have donated to that this is a way that they can receive more donations and add to their list of donors. LEADERSHIP COMMITTEES We presently have about a dozen committees and we will add to this list as members join who support various causes. Consider joining one or more committees that focus on a cause that you care about. As this part of our program develops it will be the place where all of our members who are focused on specific causes can interface with the network of NPOs with the same cause. This is a very dynamic place to be if you want to help extend REBSEA involvement with a specific cause and draw other members to it. PRESS RELEASES In addition to issuing a press release about your joining REBSEA (template in Member Resources) we urge you to consider reaching out to other REBSEA members in your area or in your state and issuing a JOINT press release. This is a very effective way to get the word out. When people hear about our concept they often go "Wow, what a great idea" and go to our website or save the information for later use or to pass along to a friend. FORUM This new 'member only' section of the website is a place to discuss referrals between members, to ask questions and begin discussions with other members, to share with other members ideas that have worked well for you with working with NPOs, and anything else that members wish to communicate to other members. SEE WHAT OTHER MEMBERS ARE DOING Some REBSEA members are very creative and proactive in promoting the REBSEA program. HABITAT FOR HUMANITY This is an organization with great support from the real estate community across the U.S. and Canada. Many of our members are on the board of directors of their local Habitat chapters. The statewide Habitat for Humanity Colorado was among the first to become a NPO member of REBSEA and is already working with a couple of Colorado REBSEA members to find suitable building sites to purchase. If you are involved with your local Habitat chapter, or want to be, please reach out to them and ask them to become a NPO member of REBSEA. Explain how this can become a sustainable new source of donations for them by working with you. As we increase our involvement with local Habitat chapters it is our goal to engage the national organization as we demonstrate positive results for them. This is in fact our plan for each and every national NPO that has local chapters. It is a process. It will happen. Part 2 is about what REBSEA is doing to drive traffic to our members so that they can do more business and make more donations to causes that they care about. This is a process that is unfolding day by day and grows with each new member and each new NPO that recognizes the potential to increase donations by working with the REBSEA network. If you are reading Part 2 because you simply do not have the bandwidth to be very proactive as a REBSEA member we ask that you at least reach out to NPOs that you have donated to and/or wish to support and invite them to join REBSEA as a NPO member (at no cost). Just explain how this can help them to receive more donations and increase their number of donors. We would also ask that you consider adding the REBSEA logo to your website and marketing materials. Lastly we would appreciate it if you would reach out to any lenders or insurance agents who you do business with and tell them about our program and urge them to join REBSEA. When we blog on a regular basis to our database and social media it is seen by hundreds of thousands of people and multiplied by being posted on countless groups in LinkedIn and Facebook and Google plus, etc. This regularly drives traffic to our website and Member Directory. Many of our blogs contain contact info for individual REBSEA members as well as reference to a specific Leadership Committee. Consider joining one of these committees. We have seen an increasing number of referrals made between REBSEA members around the U.S. and Canada. The new 'members only' section of our website called FORUM is a place to post referrals or look for referral opportunities between members in different areas. If you read above in Part 1 about how we are going about engaging Habitat for Humanity you will see an example of what is at work presently with many NPOs. As more local NPOs choose to work with REBSEA it encourages others to do so as well. This is to be expected because anytime you introduce something new and innovative you find a small group who will recognize the potential and join in and a much larger group who will only join in when they see others doing so. As this process unfolds you will see an increasing number of NPOs join REBSEA and the result is more traffic to our website where more people will see your profile and choose to contact you for your services. This is only the beginning of our second year of introducing the REBSEA program and the results so far are nothing short of amazing. EVERYBODY LOVES THIS IDEA and so we can look forward to continual and increasing and sustainable growth going forward. It is only a matter of time before you answer the phone and hear "I love what you are doing and I would like to speak with you about doing some business and making a donation to an important cause". It is a PROCESS and it is unfolding each and every day. As a NPO member the single most important thing you can do to benefit your organization is to inform and remind your entire sphere of influence, your supporters, your donors, and your database that whenever they, or anybody they know, is going to buy, sell, finance or insure a property that they can turn that transaction into a donation by working with a REBSEA member. Working together to popularize this practice is a matter of informing and reminding your supporters and in fact, making REBSEA a part of your overall fundraising program. We have templates for emails you can send to your database. You can work with your local REBSEA member to create a series of emails or even a 'drip' campaign to repeatedly remind them about REBSEA until it becomes a well-known practice. You can add information about the REBSEA program to your website, Facebook page, LinkedIn group, newsletter or any other social media outreach that you employ. You can invite your local REBSEA member(s) to your fundraising and other events to meet with your supporters and promote and explain the REBSEA program. You can ask your local REBSEA member to take a more active role in your organization if they have the time and ability to do so. This is a relationship! This is a relationship that can grow into a unique and fruitful benefit for all parties concerned. As REBSEA continues to grow and unfold as a vehicle for more types of businesses to participate, so does the benefit to your organization grow. 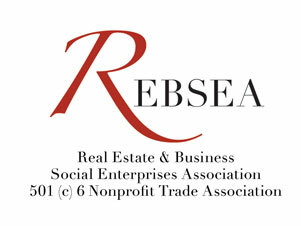 One other thing you can do to take full advantage of the REBSEA program is to reach out to your supporters and ask if they are real estate agents, lenders, insurance agents, or any type of business for that matter, who would like to join REBSEA as a way of directing more donations to your organization. We know that many, many people would like to participate in this social enterprise and all we are doing is working TOGETHER to put the infrastructure in place so that the public can exercise their clear preference to do business with those who Give Back to the communities they serve. With REBSEA members in almost every state, major city, and province in the U.S. and Canada it is obvious that this concept will continue to grow and flourish until it becomes a part of how we do business. There is nothing as powerful as an idea whose time has come.